First I will get the good things out before the drawbacks to the book. It has large well done color photos. She does stress the cross contamination of other metals by pewter, and the need for great house keeping. Along with the need for some separate tools and materials, that are used only for the pewter. It is only seven chapters, which include project step by step. In each project there is a nice touch of a list of material,( only giving the metals gauge and not the size or amount ). Tools you will need along with which kit you need( which are the soldering station or fusing kit, which you put together ). One nice touch is the page numbers after a procedure, in case you aren't familiar with it. It does have a large gallery of work, by other artists, to bad it is spread out as filler in between chapters. Now for the drawbacks, It is not for beginners in either pewter, nor metal work. It is as a lot of the Lark books have become. Lots of white space on each page, whether it is the text or photos. Cuts down on content need to fill a book. Each chapter, has its on complete page with a too small photo of the subject, along with the Chapter number, chapter subject and a short descriptive paragraph about the chapter, along with a large expanse of wallpaper as a design element! That is seven pages of no information. The first three chapters are: What is Pewter? Tools and materials. Basic techniques. The first one does cover the material well. As most don't what or need an in depth discussion. The tools and materials, chapter is lacking in a lot. The safety section does give a basic alert and warning. My biggest problem is the total lack of thought that went into the page on the torch. Other than mentioning a B-sized tank that acetylene comes in. There is nothing dealing with what type torch it is. (air/acetylene torch). Nothing about safe handling of the cylinder, mounting or use. Let alone the possibility of using other fueled type torches. She discuses the setting of a pressure on a dual gauge regulator, then mentions that you can use a single gauge (which should be dual or single stage regulators). As most torch set ups or kits are sold with a single stage that doesn't show the pressure going to the torch tip. The tools section has a very basic, description about the tools she is describing, But the saving grace is good photos of the items. The above gives a good indication of how the whole, book is done. The one bright spot in this area of the book, is the Section of the chapter on [ Adding Lips and Rims ]. For those that may find that a little bit intimidating. The final four chapters: Forming with Hand Tools, Forming with a Hydraulic Press, More Forming Methods, and Casting. Each chapter is made up of the techniques described, and a project for the procedures. Each project consists of another complete page dedicated to larger photo of the subject ( which is a good thing ). But then a short descriptive line, and the name of the subject. Along with a border color, the second page give over one complete column(or ½ page to the tools, materials, techniques list whether it needs the room or not. 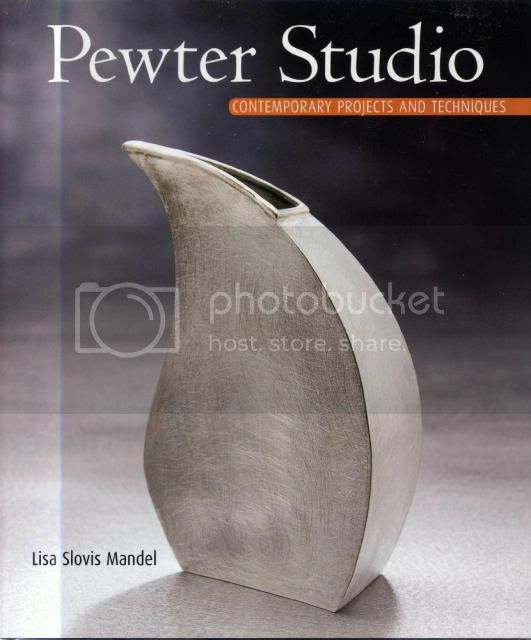 This book should have been titled Pewter Studio Lite, as that is what it is! If you do have some interest in working pewter or would like some ideas for starting points for the contemporary objects. You may find of interest. hamiltonbook.com has it at a reduce cover price Or you can look for a used copy, or keep a look out till it hits the remainder sellers sites and catalog. There are a number of other books on pewter and general metal work that are better money spent! To be honest you will better information on working pewter, on this forum as we have some very skilled people that have and doing work in it.